Public opinion survey: Syrians reject violence and outside intervention. In a major blow to foreign intervention in Syria, the just published results from an independent public opinion survey indicate that the Syrian people overwhelmingly reject the Turkish government’s policies towards their country. 65% of Syrians surveyed regarded the Turkish government as very unfriendly or hostile with only 16% characterising it as friendly. Turkey has, of course, been one of the main backers of the violent, sectarian “Free Syrian Army”. Asked to assess Turkey’s response to the crisis in Syria 69% of Syrians surveyed characterised the response as ‘negative’ with only 23% characterising it as ‘positive’. The survey was conducted 3-28 August 2012 by the Turkish Economics and Social Studies Foundation (TESEV) which is an independent think-tank supported by the German Friedrich-Ebert-Stiftung and associated with the Centre for American Progress. The 2010 edition of the report was, indeed, part-funded by the UK Foreign and Commonwealth Office and the findings of 2010 and 2011 were used in the Foreign Affairs Committee report on UK-Turkey relations. The 2012 results, which are contained in a report titled “The perception of Turkey in the Middle East 2012,” have been partially published (in Turkish) – a detailed report on the findings will be published in English on the TESEV website in the near future (according to the TESEV website). The survey has been conducted on an annual basis for the last four years and measures public opinion across the Middle East. It is worth noting, whilst Hillary Clinton is busy trying to mould a violent opposition, that in the 2011 survey, held once the Turkey, Qatar and Saudi Arabia backed insurgency was already in full swing, the Syrian people surveyed overwhelmingly rejected violent protest with only 5% being in favour. 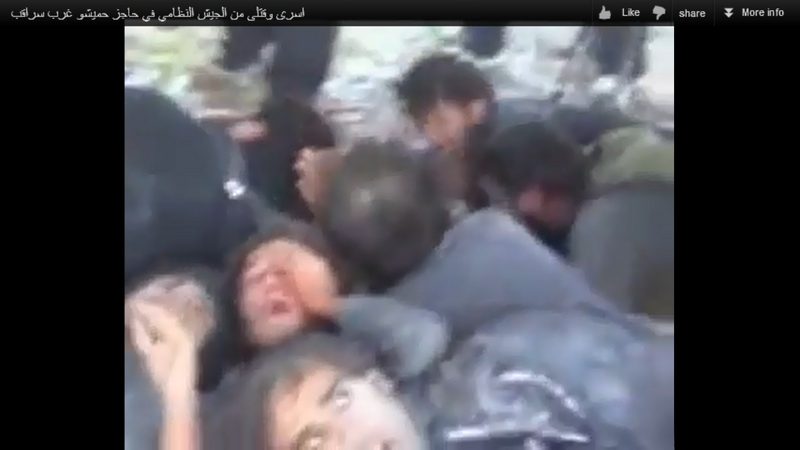 Prisoners of the FSA, moments before they are beaten and then massacred in cold blood. The results of the survey provide additional evidence to undermine further the immoral and inhumane policy of supporting an unpopular, sectarian uprising, which rests heavily on foreign, al Qaeda and openly criminal, genocidal elements and which has led to an escalating human rights disaster with the death of thousands of Syrians and destruction of the country. Update 8/11/2012: English version of the short presentation of the results is now available here A detailed report is expected soon.